Frida faces me as I work at my desk. Nothing, nothing, nothing that I have suffered compares to what she went through in her 47 years spent on this earth. Frida Kahlo was born in Casa Azul in Coyoacan, outside Mexico City in 1907, although she liked to say 1910 thereby tying herself in with the Mexican Revolution, a new beginning. As a young child she had polio which left her right leg stunted. This alone would have been enough to deal with, but fate was not done with her. At the age of 18, while a pre-med student, the bus she was riding in crashed with a trolley. Her photograph reflecting the light coming in through my French doors. Frida was thrown, her spine fractured in three places, as were her pelvis, collarbone and ribs. Her right leg, already affected by polio, fractured in many places, her right foot crushed and broken. She was impaled through the abdomen with a metal hand rail. They gave her up for dead, attending to others first. But her light was not meant to be extinguished just yet. Subsequently, Frida suffered excruciating, chronic pain and had many, many surgeries throughout her life, some of which required her to be confined to bed for months of recovery encased in a type of corset that supported her spine. The bus accident took her life as it had been and for the rest of her years she lived in spite of the pain. She fought to keep her right foot, only losing it shortly before she died. Giving up on medical school, she began to paint using an easel set on her bed. She painted flowers on her corsets by using a mirror placed on the canopy above her. 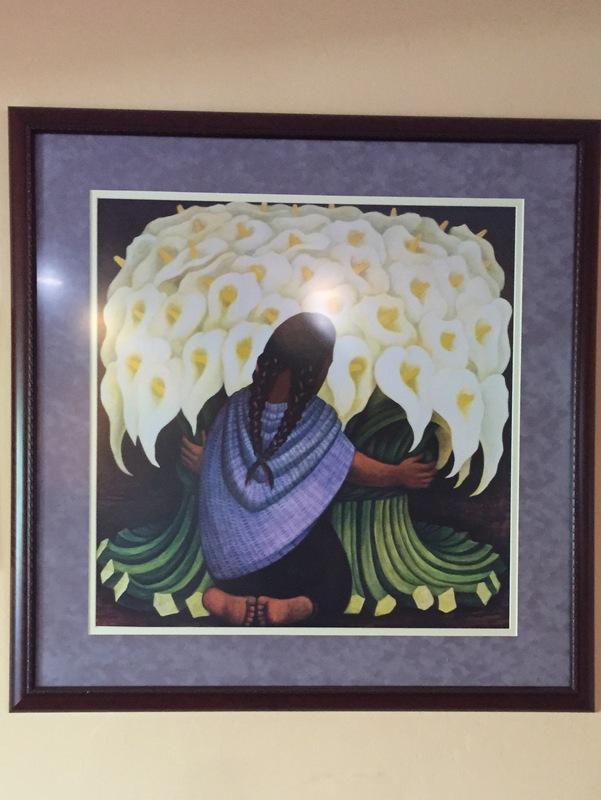 Her pain was physical and emotional for she fell in love with and married Diego Rivera, a gifted muralist who was known for his talent as well as his infidelities. 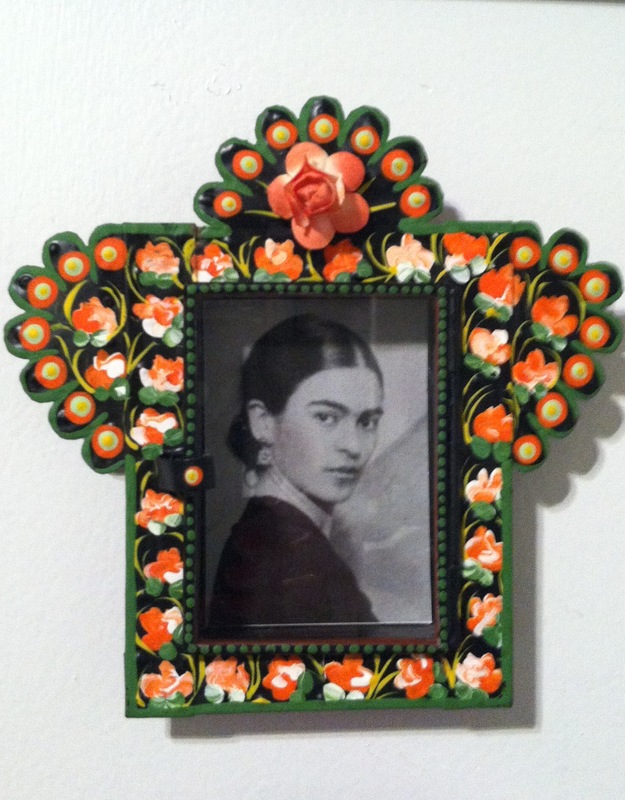 Her own sister counted among his many conquests, something that must have inflicted the deepest pain in Frida. But her greatest tragedy must have been the bus accident robbing her of the ability to bring a child to term. I imagine Frida found refuge in her painting. She became known for her self-portraits, some that are hard to look at without cringing, without wincing, without feeling the agonizing pain that radiates from the canvas and reaches out to envelop you. “I paint my own reality,” she said. Today, Frida is a phenomenon with a following. And one of her diehard followers is me. She inhabits my house; she inhabits my thoughts. When I feel down, when I am in pain, I think of Frida and her pain and how she managed to rise above. Frida painted her reality. I write mine. 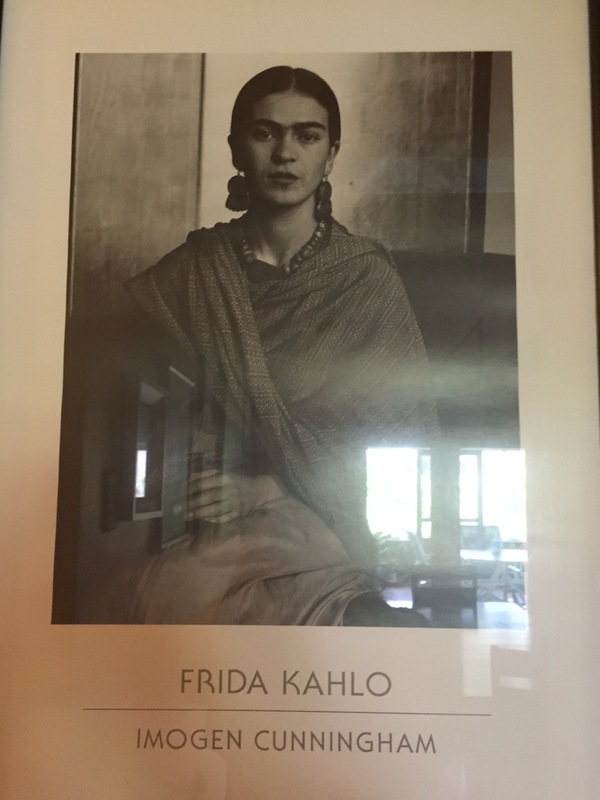 While in NYC, I visited the New York Botanical Garden where they are holding a Frida Kahlo exhibit until November. Frida loved her garden and had many plants in Casa Azul, but I did not know that she and Diego had made a concerted effort to secure many different species of indigenous plants. It was eerie walking through the lush garden, knowing that though it was not her garden, her spirit was there. I felt her pain, but I especially felt her resilience. I felt her joy of life and I understood the words written on her last painting, “Viva la vida.” Long live life. Happy birthday, Frida. May you live forever. A framed print of one of her works that hangs in my living room. I was ecstatic when I came across it in San Antonio, Texas years ago. Though I have several framed prints of Diego’s work, this one is by far my favorite. This entry was posted in Uncategorized on July 6, 2015 by Irma. Beautiful post. I think now in whatever garden I enjoy, I will think of you and this brave woman. 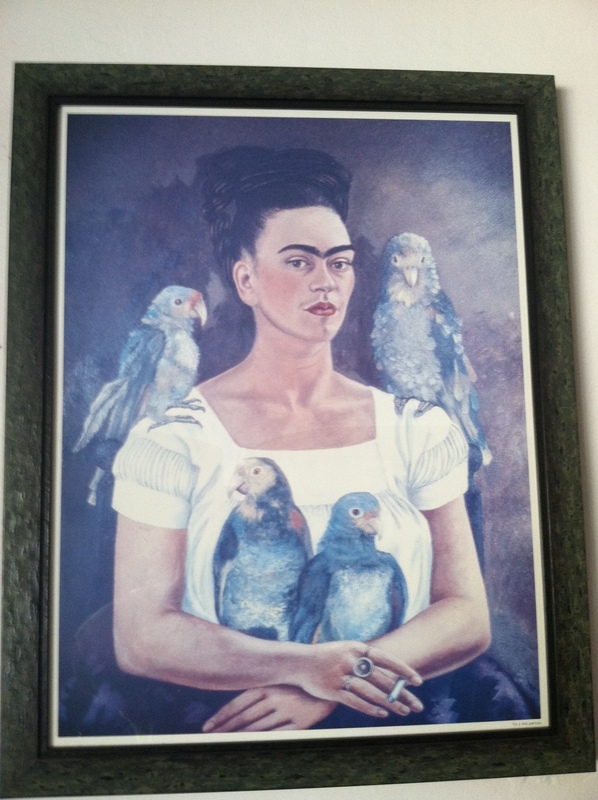 Thanks, J. I find such comfort working with my plants.Nothing that compares with what Frida had! I too often think of Frida Kahlo, and how she continued to express herself and cope via painting after her crippling accident–beyond the fact that even without knowing this back story, I would still love the images she created. I read about the exhibit at the NY Botanical Garden and even though I passed through the city twice last month, I didn’t have the time to go see it. I am glad that you were able to see it in person. I was lucky enough to see a retrospective of her work at the SF Museum of Modern Art a few years ago, as well as to visit some of her residences outside of Mexico City. One of my favorite cookbooks (and I have *many*) is “Frida’s Fiestas: Recipes and Reminiscences of Life with Frida Kahlo.” Not only are the recipes wonderful, but the full-page photography in the book is absolutely beautiful. I’m sorry you didn’t get to see the exhibit in NYC, but I envy your going to her home in Mexico. That is on the top of my todo list. Soon, this year or next. I will check out that cookbook. I hope it’s still available. Sounds wonderful. Take care, hope you are doing well.